PP. 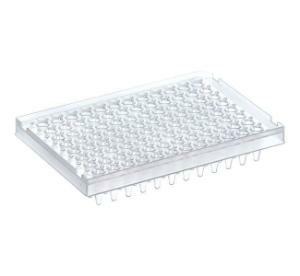 These 96-well semi-skirted plates offer increased rigidity, which allows for multi-channel pipetting and reduces plate warping during thermal cycling applications. These plates feature a cut corner at the A12 location and thin well walls. They are compatible with all ABI platforms, including sequencers, and do not require adapters. The barcodes are the industry standard code 128. The label itself can withstand temperatures from −196 ºC up to 120 ºC to ensure that the barcodes stay on the plate throughout the entire workflow. It also has a special coating to virtually eliminate any ‘rubbing off’ of the code during handling. The dual barcodes are located on the opposite numeric and opposite alpha sides of the plate.